Getting a smart divorce requires educating yourself on many new topics. Listed below are websites and books concerning divorce and communication that we have read and recommend. The websites are a good place to start. 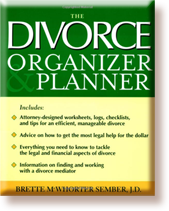 They contain articles on important divorce topics and take only a few minutes to read. We hope that this collection of reading materials assists you in your self-education efforts. Divorcesource.com offers a wide variety of divorce-related products and services to assist in preparing you for what you are or will be experiencing throughout your divorce process. View articles written for divorcesource.com by Sandy Arons. Divorce Magazine is the Internet’s leading divorce and separation resource site, providing information and advice about divorce law, divorce lawyers, family law, children and divorce, and other divorce-related issues as well as information on divorce professionals such as family lawyers and online divorce. Divorce360.com provides help, advice and community for people contemplating, going through or recovering from divorce and the issues around it–custody, child support, alimony and litigation. Description: A fully revised and updated edition of the essential guide for men and women moving through the turmoil of divorce. Review: A common-sense, compassionate, human book about the crazy process that more than half of us go through. This should be required reading with all marriage licenses. Description: Divorce is overwhelming enough without having to deal with the financial, personal, and legal paperwork. When you are organized, you feel more confident, and you are more likely to get what you want. The Divorce Organizer and Planner is your guide to managing your divorce and getting what you want—while keeping your legal expenses to a minimum. Written by a family attorney with years of experience helping people navigate the divorce process, this book empowers you with the knowledge and tools you need to take control of your divorce. Review: The groundbreaking classic, now revised, updated and expanded, covers the legal, financial and emotional realities of creating two happy and stable homes for children in the often difficult and confusing aftermath of a divorce. Description: Are you and your spouse speaking the same language? While love is a many splendored thing, it is sometimes a very confusing thing, too. And as people come in all varieties, shapes, and sizes, so do their choices of personal expressions of love. But more often than not, the giver and the receiver express love in two different ways. This can lead to misunderstanding, quarrels, and even divorce. Dr. Gary Chapman identifies five basic languages of love and then guides couples towards a better understanding of their unique languages of love. Learn to speak and understand your mate’s love language, and in no time you will be able to effectively love and truly feel loved in return. Skillful communication is within your grasp! Review: Unhappiness in marriage often has a simple root cause: we speak different love languages, believes Dr. Gary Chapman. While working as a marriage counselor for more than 30 years, he identified five love languages: Words of Affirmation, Quality Time, Receiving Gifts, Acts of Service, and Physical Touch. In a friendly, often humorous style, he unpacks each one. Some husbands or wives may crave focused attention; another needs regular praise. Gifts are highly important to one spouse, while another sees fixing a leaky faucet, ironing a shirt, or cooking a meal as filling their “love tank.” Some partners might find physical touch makes them feel valued: holding hands, giving back rubs, and sexual contact. Chapman illustrates each love language with real-life examples from his counseling practice. Through checklists, quizzes, and wacky vignettes, you’ll recognize yourself on every page. Description: No matter how bad the marriage, there is no way to end it without feeling a sense of loss. The difference between people who live in the pain and those who grow from the experience is the knowledge of how to grieve and let go. To recover from the trauma of divorce requires turning losses into opportunities. Sharon Wegscheider-Cruse meticulously examines the obstacles that hold many divorced people back and effectively deals with overcoming these barriers. She shows you how to care for yourself through the crisis stage of divorce, welcome new feelings and turn an angry ex into a future friend. She devotes an entire section to helping kids cope and teaches you how to develop a healthy and effective single parent family. She also discusses the pitfalls and relapses that might occur after the healing process has begun. She guides you through re-entry into the dating world and finally, she reveals the secrets of achieving a happy, loving and lasting remarriage. Review: Wallerstein, author of The Unexpected Legacy of Divorce (2000), and Blakeslee, a science writer, draw on more than 30 years of research to provide advice and assistance to parents who are either facing divorce or coping with its aftermath. First they define the major challenges: getting the parent’s life under control, preparing children for the breakup, and creating new relationships with the ex-partner. They emphasize that divorce is not a single event but a process with many stages. 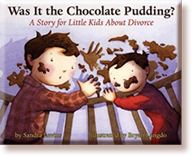 The book is organized around the steps of a divorce and its aftermath: the immediate breakup of the family, when reactions are at their rawest and most emotional; the first few years, when the new family routine is being established; a period of assessment 5 or 10 years after the breakup; the reconstituted family after remarriage; and communicating with children in young adulthood to help them develop and sustain strong relationships. The authors offer advice that runs the gamut, from answering questions children ask about divorce to choosing the best custody arrangement. This is a very valuable resource for families at any stage of breakup. Description: While there are many trade books on children and divorce, most tend to be filled with extensive discussions of the psychological impact on children, with little effective advice. You want immediate answers and quick access to expert strategies you can use to help your kids today and in the future. Making Divorce Easier on Your Child arms you with 50 effective strategies and action steps for helping your kids cope with divorce, packaged in a convenient, quick-bite format. It is based on the authors’ years of clinical experience dealing with the children of divorce, as well as their extensive research into the causes and cures of divorce-related emotional problems. Description: In a question-and-answer dialogue format, the authors tackle the concerns hidden behind what kids say and provide suggestions for dealing with those problems, whether they be feelings of blame, desertion, or a child’s hopes for reconciliation. 15,000 first printing. Review: With an open layout and reassuring text, this title in the Scholastic Choices series is an inviting guide to the facts and feelings of parental divorce. 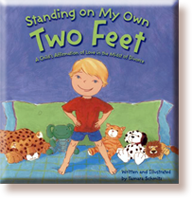 Personal stories and photos of kids begin each chapter, and frequent statistics and quizzes will help readers assess their feelings and put them into context. The solid advice is well presented, as are the messages that readers are not alone and that there are many ways to seek help. A glossary and further resource listings are appended. Description: More than 250 young people share how they cope with their parents’ divorce, and 20 counsellors add their insights. Review: Full of great advice for kids, and parents too. In many ways, it's a peer support group in print. 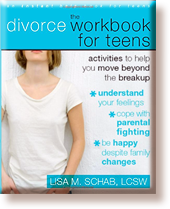 Description: This workbook helps teens understand their feelings, cope with parental fighting, and be happy after their parents’ divorce. Activities cover emotional issues, such as developing self-awareness and communication skills, as well as the practical issues related to divorce, such as living in two homes. Description: No one wants to ride the Divorce express, especially Phoebe. It means leaving her New York City apartment and friends, moving to the country with her dad, and taking the bus every weekend to visit her mom in the city. It means she has to go to ninth grade in a new school, and see her father go on dates. It’s a hectic life with no time to feel she really belongs with the kids in either place. Then, just when Phoebe gets a handle on juggling the pieces of her life, her mother makes a decision that will change everything again. Can Phoebe be herself and still be part of both her parents’ worlds? Review: It’s hard to be a bunny. Sometimes a bunny feels angry—especially if someone is teasing or if Mom is paying more attention to the new baby in the family. But there are things a bunny can do to keep anger from taking over—exercise, rest, cry, or even ask for help. This gentle book puts an adorable bunny in a variety of situations that preschool or grade-school children can relate to. 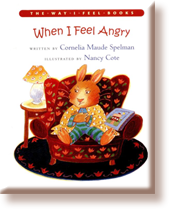 Instead of acting out, the bunny and her friends find constructive ways to deal with their anger. The illustrations are comical and gentle. In a note to parents, the author, a social worker, explains that it’s important to let children know that they can’t avoid their feelings but that they can avoid acting in bad ways. The note also includes advice to parents on setting good examples when dealing with negative emotions. Pair this with Molly Bang’s When Sophie Gets Angry… Really, Really Angry for even more to talk about. Description: Divorce is never easy, not for parents and especially not for children. 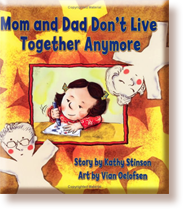 More than 20 years ago, celebrated author Kathy Stinson wrote in a positive way about the confusion, insecurity and sorrow experienced by young children whose parents have separated. Since then, Mom and Dad Don’t Live Together Anymore has brought comfort to countless families dealing with this difficult issue. This critically acclaimed best-seller, reprinted 15 times, now returns with fresh new illustrations and updated text. For the young girl of the story, splitting time between parents has its ups and downs. She likes the elevators and garbage chutes of mom’s city apartment, but the horses near dad’s country home are great, too. Not knowing where she’ll be for holidays is hard. Even so, she is comforted knowing that each parent still provides the same love and caring — just not together anymore. Sensitively told and featuring reassuring illustrations, Mom and Dad Don’t Live Together Anymore offers children a gentle entry into an upsetting subject. Description: Young Alex’s parents are divorced, and he spends time with each of them. He has two rooms, two favorite chairs, two sets of friends, two of everything. He loves both of them no matter where he is, and they love him, no matter where they are. The ink, watercolor, and gouache illustrations are comforting and warm. There is no sign of the child missing one parent when he is with the other or questioning his situation, and he seems quite well adjusted. This book is clearly intended to help parents tell their children that they are still loved despite their living arrangements. 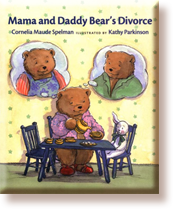 Description: The author of After Charlotte’s Mom Died explores the topic of divorce in this story of the Bear family. One sad day, Mama and Daddy say they are getting a divorce, and Dinah is scared. But when Daddy moves into his new home, Dinah and her sister Ruth visit him on weekends and Dinah still takes walks with Daddy like she used to. 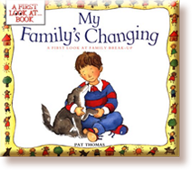 Description: Daddy lives in a different house now and Tom hates it when he leaves. Then Mom gives Tom a teddy bear that tells a story about a little bear who lives in the forest who has problems just like Tom’s. 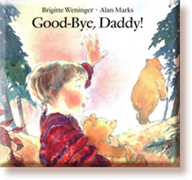 A sensitive story about separation and divorce. Full-color illustrations. Review: Grade 1-3 children familiar with the Browns’ Dinosaurs Beware (Atlantic, 1983) and Marc Brown’s Arthur books (Atlantic) will delight in this new foray into an area of deep concern for the youngest readers. 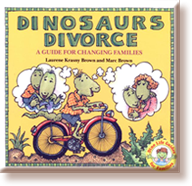 Sympathetic to the full range of feelings that divorce produces, the authors use evocative cartoon dinosaur characters to convey their message. Chapters address such concerns as why parents divorce, what will happen to “me,” where will holidays be celebrated, living in two homes, etc. Expressively illustrated with accompanying succinct text, this upbeat, straightforward treatment of a potentially confusing, traumatic childhood experience is comprehensive. Prediction: this will become a real “security blanket” for those young readers in need. Description: With childlike innocence and humor, a young narrator living with his single father and brother explains divorce and it’s grown-up words — like “New Arrangement,” “Ideal Situation,” and “Differences” — from a kid’s point-of-view. Special emphasis is placed on the fact that divorce is not the child’s fault, that it is a grown-up problem. Deals with practical day-to-day matters such as single-family homes, joint custody, child-care issues, and misunderstandings. Includes Note to Parents. Full-color illustrations through-out. For ages 2-6. Description: Addison is a regular kid whose parents are going through a divorce, but he knows that no matter what happens, his parents will always love him. 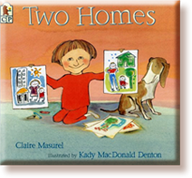 The text in this beautifully illustrated picture book is inspiring, gentle, and uplifting, and teaches kids that having two homes to live in can be just as great as having two strong feet to stand on. Review: A competent piece of bibliotherapy aimed at helping children of divorce deal with their new, difficult, and conflicting emotions. Told by a young girl whose parents have just told her they are getting a divorce, the narrative then goes through the range of the child’s possible emotions, as the adults suggest how she might be feeling. She, in turn, imagines herself to be an animal that would adequately express her emotions. When her father tells her that it’s okay to be scared, her response is, “I wanted to be a lion with a roar so loud that everyone would think I was very brave.” Assurances of her parents’ continued love and that certain family rituals will remain the same make her feel better. Full-page illustrations capably portray the images in the text, especially the metaphors of the animals that the girl uses to express her feelings. The book concludes with a two-page note to parents suggesting ways to deal with their children’s reactions. A worthy and appropriate addition to most parenting collections. Review: This attractive book, written by a psychotherapist, introduces the idea and process of a divorce, as well as discussing how it often affects the members of the family. While encouraging children to talk about their feelings and reassuring them that their parents will continue to love them, the text does not minimize the changes, difficulties, and pain that come with the territory. Bordered boxes labeled “What about you?” carry questions for parents to ask their children, so kids can relate their own feelings and experiences to those mentioned in the text. On every page, appealing ink-and-watercolor-wash illustrations show one family coping with a divorce. 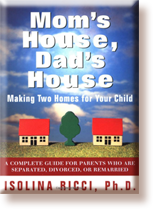 Informative and reassuring, this book will be a good starting place for many families discussing divorce. Description: If your parents fuss at you does it mean they don’t love you? How can you tell if your father loves you, if he lives in another city? Are you “bad” when you get angry with your mother or father? Why is it a mistake to talk to one parent about another? Do you blame yourself for your parents’ divorce? 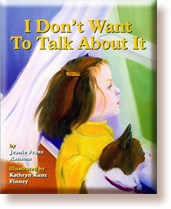 This warm and honest book provides reassuring answers to these and many more crucial questions children ask about divorce. Description: This companion to The Juggling Act parent’s book is specially aimed at kids ages 7-12. 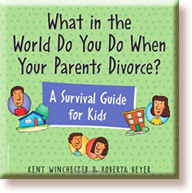 It explains divorce, new living arrangements, and other basics to help children understand what’s happening in their lives. With honesty and simplicity, the authors help kids realize that divorce isn’t their fault, strong emotions are okay, and families can survive difficult changes. Written to and for kids, this book is also recommended for parents, educators, counselors, and youth workers. Description: Divorce affects thousands of children each year, and each and every one of them will benefit from the caring, friendly activities in this book. While children may sometimes not show apparent signs of the stress of a divorce, the strain it places on them is very real and, left undealt with, can develop into serious problems in the years to come. 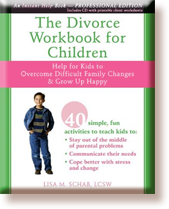 Written by an experienced counselor, to The Divorce Workbook for Children offers you simple and engaging activities that can help you help kids address and cope with issues related to parental divorce. The goal of these activities is to help kids feel “out of the middle” of the parental conflict and learn to be more resilient and self-reliant. Description: Zoe and Evan Stern know firsthand how it feels when your parents divorce. When their parents split they knew their lives would change but they didn’t know how. A few years later, when they were 15 and 13 years old, they decided to share their experience in this positive and practical guide for kids. With some help from their mom, Zoe and Evan write about topics like guilt, anger, fear, adjusting to different rules in different houses, dealing with special occasions like birthdays, adapting to stepparents and blended families, and much more. Including updates from grown-up Zoe and Evan 10 years later, this honest guide will reassure children of divorce that, though it may seem it sometimes, it’s not the end of the world.